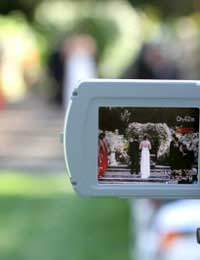 Camcorders are very useful for preserving memories of any event but never more so than for capturing special occasions. However their success and quality will be as much about planning as the actual filming itself. The three most important factors in the planning stages are the location, the type of format and the participants. You need to consider the location and space available in which you are going to be filming and look at all the lighting and audio factors and if there are likely to be any restrictions or obstacles - the number of power outlets, for example. If you’re filming indoors, you may need to compensate if the building is dimly lit. If you’re outside, you may need to think more about sound quality if, say, you’re trying to capture the solemnness of the exchange of wedding vows but there’s busy traffic nearby. When filming special occasions outdoors especially, you should be looking to establish some quality shots which could be used as visual background to audible speech or voiceovers. For example, if you want to set the stage for a wedding, you may want to shoot a wide shot of the magnificent church outside before you cut to the action inside. To create a good quality film, it’s important you try to speak to the main participants to get a good understanding of how they’ve planned the occasion to run and to gain an understanding of any extra special moments they may have planned to incorporate into the event. For example, whilst you may think a wedding follows a common, predictable format, they are all different so you’ll want to be speaking with the bride and groom and their parents alongside getting to know the best man and bridesmaids and finding out more about things like the order of the speeches that are planned. In fact, the more you can find out about the participants, the more personal and natural the film is likely to be. That said, you may already know them well which will give you an added advantage. Things like birthday parties will follow a similar pattern. No two ‘candles being blown out’ routine is ever exactly the same. Like any good home movie, you should be thinking about a beginning, a middle and an end and visually conceptualising in your mind how your ‘story’ is going to progress scene-by-scene. With each scene you break it down into, consider the angles you wish to shoot from and take into account any adjustments you’ll need to make with your equipment. Don’t forget your tripod. Wobbly, juddering images ruin a home video and try using an external microphone if you think background noise is likely to affect the sound quality. Filming a special occasion is all about the people directly involved and their nearest and dearest. In other words, you’ll want to be sure to capture the human element. Consider the type of event, its format and the type of emotions which will reflect the event itself. Then work out when and where you’ll be likely to get the best opportunities for close-ups, interviews (if appropriate) and any spur of the moment reaction shots and make a note of these on your scene planner as these are likely to be the kinds of shots which will best reflect the event itself. You’ll be looking to shoot reactions of joy, amusement, pride, surprise, perhaps the love of a parent and any other intense displays of emotion you anticipate witnessing should be noted. Don’t forget to vary your angles of filming with each scene and, whilst making appropriate use of any technical features or effects such as the use of zoom or adding background music, don’t overdo these effects as they can look very amateurish if you’ve incorporated them simply to show what your camera can do. A good tip whenever using effects is to ask yourself why you want to use them before shooting a particular scene and to feel confident that their use is justified and will add to the overall quality. In conclusion, filming those special occasions will be all about capturing emotions and feelings as well as the event itself and keeping in mind how you intend to capture those feelings when filming each scene will be the difference between an excellent production which perfectly encapsulates the day’s events and a bog-standard one which people will soon get bored of watching.